Nike Air Max Trainer 1 has just been released by Nike. Our experts are working on a detailed review. Please, come back later. Nike offers CrossFit fans a throwback look in combination with enhanced performance in the Nike Air Max Trainer 1. The shoe pays tribute to the original Nike Air Trainer 1 released in 1987. Putting the trainers next to each other will show a huge difference in style and features; however, the new model inherits the all-in-one approach of the original one as it accommodates both plyometrics and weightlifting exercises. Another similarity lies in the use of the Air Max unit for cushioning. It is a lightweight, see-through air bladder in the heel unit which protects the feet and legs against impact. The Air Max is incorporated into the rubber portion of the outsole which extends up on the lateral and medial sides of the heel to ensure rearfoot steadiness. The TPU counter at the back also contributes to heel stability. 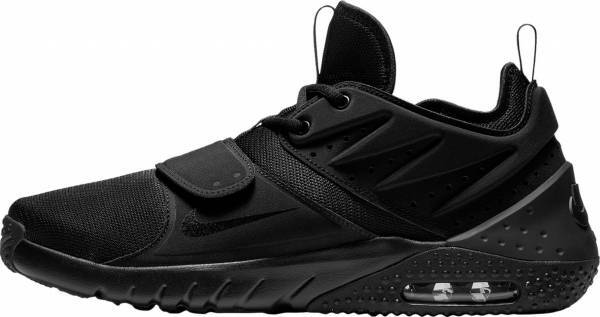 The Nike Air Max Trainer 1 is available in men’s version only. It comes in US sizes 6 to 15, including a selection of half-sizes. The shoe is offered in a standard D - Medium profile, catering to feet with regular measurements. An inner sleeve aims to give a snug fit in the ankle and the midfoot. The foothold is further secured by the forefoot strap and the drawstring-like laces. A rubber outsole is placed at the bottom of the Nike Air Max Trainer 1. It is made thinner and more pliable in the forefoot to allow for natural foot flexion. A forked flex groove is added for both forward and side-to-side flexibility. The lugs in this part are facing different directions to render traction during constantly-changing exercises. The front rubber pod extends up the toe box, forming a toe bumper. The heel part of the outsole is made denser and firmer to create a steady platform for weightlifting exercises. It has a nubby texture closer to the midfoot for traction and round dints at the back portion for a suction-cup effect. The most prominent cushioning unit of the Air Max Trainer 1 is the Air Max. It is a lightweight, transparent membrane with pressurized air inside. It is designed to quickly return to its original shape right after the impact. The Air Max is embedded into the rubber compound, giving a balance of shock-absorption and firmness in the heel to prevent the rearfoot from wobbling. A layer of foam cushions the midfoot and the forefoot. It is made to be pliable to allow for unhindered foot flexibility during plyometric activities. The Nike Air Max Trainer 1 has two variations of the upper: a mesh one and a leather one. Both are made to be supportive yet pliable enough for a wide range of motion. From the inside, the foot is snuggly held by a breathable mesh sleeve. A Velcro strap is added at the forefoot to keep the foot firmly in place during side-to-side movements and weightlifting exercises. A rearfoot and lateral brace is also enhanced by thick synthetic overlays at the quarters and the back. These overlays have an aggressive jagged texture for added abrasion-resistance and support. A miniature lace-up closure connects the quarter overlays at the top of the instep. With only two pairs of eyelets, this lacing system mostly serves to conch the collar. The tightness is regulated by the knob which makes the laces work as drawstrings. The trainer also employs a wide heel clip to steady the rearfoot. It is made of a lightweight yet firm TPU (thermoplastic polyurethane) material. The Nike Air Max Trainer 1 is available in various colorways, but the brand released a version with a twist. The Nike Air Max 1 AMP looks strikingly similar to the Black/Black/Black variation of the original. What makes this model different is the strap. Instead of black, it uses the Dark Obsidian shade which, when hit by light, is reflective. This update gives the trainer its amped up look, thus the name.